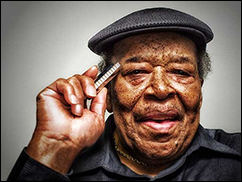 AUSTIN, TX (CelebrityAccess) — Blues legend James Cotton, famed for his virtuosity with the harmonic, died on March 16th at the age of 81. According to his label, Alligator Records, Cotton died of pneumonia at St. David's Medical Center in Austin, Texas. Known as “Mr. Superharp,” Cotton was a prolific musician, recording nearly 30 solo albums, performed with blues greats such as Howlin' Wolf and Muddy Waters and developed a reputation as a ferocious live performer. Born in Tunica, Mississippi in 1935, Cotton learned harmonica directly from early and influential blues artist Sonny Boy Williamson II and was a working musician by the age of 9. By the early 1950s, he was playing with Howlin' Wolf's band and had his first recordings as a solo artist with Sun Records in 1953. He also collaborated with artists such as Muddy Waters, performing on seminal cuts such as Muddy's rendition of Red Foster's 'Got My Mojo Working' in 1956. In he late 1960s, he formed The James Cotton Band, and cut solo albums for Verve and Vanguard and performed live in venues ranging from the Fillmore East in New York, the Fillmore West in San Francisco. In the 1980s, Cotton signed with Alligator, releasing two solo albums as well as 1990's Harp Attack! with Junior Wells, Carey Bell, and Billy Branch. He would continue to record until 2013 when he scored a hit with Cotton Mouth Man, earning him a Grammy nomination. Over the course of his long career, he won a Grammy Award, six Living Blues Awards, and 10 Blues Music Awards and was inducted into the Blues Hall Of Fame in 2006. In June 2010, Cotton was honored by New York’s Lincoln Center, where his friends and colleagues Hubert Sumlin, Pinetop Perkins, Taj Mahal, Shemekia Copeland and others paid tribute to him in an all-star concert. The Festival International de Jazz de Montréal honored Cotton with their 2015 B.B. King Award for his seven decades of contributions to the blues. Cotton is survived by his wife Jacklyn Hairston Cotton, daughters Teresa Hampton of Seattle, Washington and Marshall Ann Cotton of Peoria, Illinois and son James Patrick Cotton of Chicago, Illinois, as well as numerous grandchildren and great-grandchildren.